Click "Comment" to join the conversation or to ask us a question. The Museum's own Eric Cale was featured in this KWCH 12 Eyewitness News segment on the historic heat! Did anyone notice on KWCH Channel 12 news 10:00 PM Saturday night, when they were filming the kids running around in the parks fountains staying cool, one little boy flipped off the camera with both fingers? Bethels new basketball coach and former KU star. Kim Hynes just came by and did an interview for protecting your children on the internet. Airs tonight at 10... tune into KWCH Channel 12 folks!! There will be a story tonight (July 13) on the 6 p.m. KWCH 12 newscast about the wind turbine being installed at Southwestern College. Hey everyone! set your dvrs for tomorrow morning! I will be joining Randy Stuhlsatz on the KWCH morning show (channel 12) to talk about anime festival wichita! Here is a sample post from the Scribblelive page. Here is a sample email post. 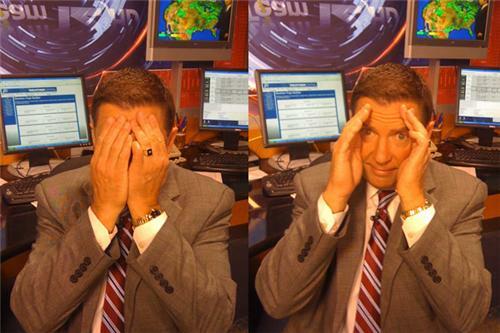 Mark Larson hopes his "Peeking" craze catches on. I took the ACT five times and the best I got was a 21. Keep your head up Dreamius!